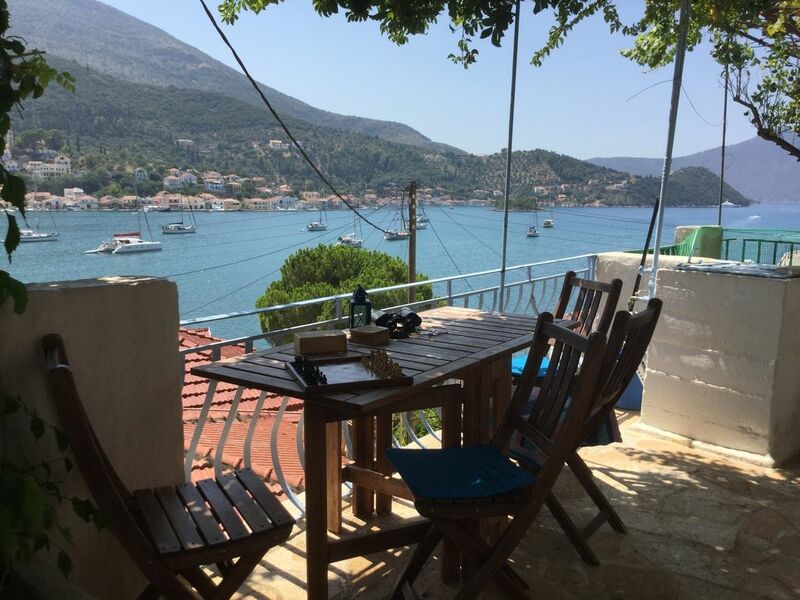 "Vathi View " is a beautiful little traditional Greek house that is perched 3 houses back from the water's edge, looking out over the stunning Bay of Vathi to the town centre (the Plateia), which is a 2 minute stroll away. The house has 2 bedrooms, one with a King size bed, the other has 2 single beds. Both bedrooms have air-conditioning and direct views over the Bay of Vathi. There is a small lounge area to the rear of the house ( air-conditioned ) and a small (but very functional) kitchen area. There is also a fully tiled shower room / toilet . There is a beautiful stone tiled balcony to the front of the property which overlooks the entire Bay that is perfect for dining. At the rear of the property there is a large timber built decked area with table/chairs and sun lounging area with "cool off" shower. The views from the deck are outstanding. Vathi is the perfect location for those looking for an "unspoilt Greek Island" holiday. We came came to Ithaca 23 years ago and fell in love with it! We were fortunate to get the opportunity to buy this beautiful little property around 14 years ago and have enjoyed countless wonderful holidays with our two sons ever since. This is the first year that we have offered it for rent and hope that many people will be able to experience the wonderful friendly atmosphere of this beautiful, unspoilt, little Island. Both bedrooms and in livingroom. Bed linen provided. Linen changes & house cleans during stay are available on request ( at a charge ). In outbuilding at rear of property. Vathi View, What A View!! We thoroughly enjoyed our stay at Vathi View - the house is a traditional Greek home, comfortable enough and well equipped to accommodate a couple or family of four. We loved the two terraces, both exclusive to the house, one immediately outside the front door and an upper wooden deck with sunbeds and an outdoor shower - both with outstanding views over the harbour, it was so lovely to relax with breakfast or evening glass of wine just watching the comings and goings of the sailing boats and occasional "gin palace"! Its location is very convenient for supermarket, bakeries, restaurants (of which there are many), banks, scooter and boat hire, all within 5 minutes' walk but just far enough away from any busyness - not that Vathi was "busy" in comparison to some Greek island destinations in July. The owner, Brian, was brilliant with his responses to any questions and queries I put to him prior to our visit, no matter how daft some of my questions may have seemed, we had all the information we required by the time we arrived to just unpack and get on with our holiday. Brian also recommended Nico of Alpha Cars in Vathi for scooter or car hire, which I would recommend if anyone wants to explore Ithaca – Nico is also the contact if there are any problems at the house, needless to say there weren’t any! All in all a wonderful relaxing holiday on a beautiful, lush Greek island.